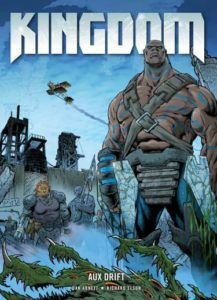 Kingdom: Aux Drift is the fifth installment of the Kingdom series by Dan Abnett and Richard Elson. The series follows Gene the Hackman, a part-dog, part-human hybrid known as Aux, as he makes his way through the post-apocalyptic wasteland that was once Earth, now ruled over by a race of giant insects simply called “Them”. Colour me interested. I haven’t dipped my toes into this particular genre that much, I’m more dystopian thriller than post-apocalyptic action, but I figured you can always try something new. Coming into this book cold was a little odd; I hadn’t even realised that it was placed so far into the series, but it has a pretty succinct “previously” section in the front, so I didn’t feel too lost. It seemed like a reasonable jumping-on point for anyone who might just pick it up in their local comic shop, though I was a little worried that four books worth of story could be described in a single page. I just assumed it was a well edited synopsis; I may come to regret that. The general setup does smack of the post-apocalyptic genre, and the aesthetic reminds me a lot of the Mad Max films as well as books such I am Legend, but it doesn’t feel like it’s stepping on anyone’s toes. There’s just enough of a hint in the visuals to click the reader into the mindset of the genre and then to take them on a different adventure. Visually, it’s very solid. It has a dynamism that complements the genre well and pulls your eye through the action scenes that litter the book. The one thing that stood out to me with the art was that none of the female characters are overly sexualised or ridiculously proportioned. Isn’t it stupid that that’s still a point that needs to be made when looking at comics? In fact, there is a wide range of women, body types, ages, and ethnicities; it’s refreshing to see a creative team focus on bringing more realistic ideas of women into comics. The designs of the Aux–the dog people–have a huge variety, pulling together not just aspects of different dog breeds, but also loads of different human traits and body types. This is also the case with the “Them”. It’s very clear that there has been great care taken over the appearance of all the characters to create a rich, real-feeling world. There’s no suffering for clone faces or lazy background characters. I feel it’s much more interesting than many mainstream comics to look at. I like the art style, it’s gritty but still maintains a feel of classic comic book. I do feel that the colour palette feels a little dark, but that’s clearly a choice to compliment the story, and honestly is just personal preference for me. However, I did feel like the actual story left a lot to be desired. The narration is odd and feels like it’s uncertain of what it wants to be. Half the time it feels like it’s almost a first person narrative but also trying to over explain everything that’s happening. On top of this, the voice is stylised; it’s sort of primitive, like the way that Gene speaks, but it’s not constant in this. I feel like if I had read more of the books then maybe I would have got into the style, but as a first time reader I found it jarring. This is also the case with a lot of the dialogue. Gene, and many of the other Aux, talks in a stilted “caveman-esque” way that after a while I found incredibly grating. It forces the dialogue to be slow and cumbersome, and provided nothing for me to connect with. You’re meant to like your main characters and I just found them annoying. The story itself was very slow. The premise of the series sounded really interesting and I wanted to be engulfed in this world, but every time I thought I might be about to properly engage with the story and the characters it would all be thrown away again with a battle that’s pages long. The progress is halted again and again, these almost dialogue-free battles taking up great swathes of the book, and very often repeating bits of information you’ve been told already. It feels like filler, and it smothers the story. It’s incredibly frustrating. But I can see why people would like it. If you like Warhammer 40K, the more trigger happy entries in the post-apocalypse genre, or in fact just like a good, well written action film, then I can see the attraction of this book. It is well constructed and the action is interesting and dynamic, but, for me, it didn’t work. I can see that possibly this book isn’t for me. I’m going to say it now; this is not a book I would pick up. It’s too “manly”. It feels like I’m reading someone’s male power fantasy. This is an image of a man who can go around banging people on the head and asserting himself as the alpha. It feels very, and I hate to say it, toxic. Despite the fact that I absolutely adore a good bit of James Bond or Sam Spade, you know, proper, ridiculous toxic men, this book holds no appeal for me. The difference between the caveman and the Sam Spades of this world is that, even though they are the worst in so many ways, these James Bonds are suave and clever and interesting, they hold an attraction not only physically, but as characters, as people. You want to know what’s inside their heads. Kingdom: Aux Drift lacks that. I don’t care about Gene because he holds no interest as a person, and, even more than that, he isn’t my power fantasy.